Bad Penny: Tickets to Belfast, this way! Tickets to Belfast, this way! 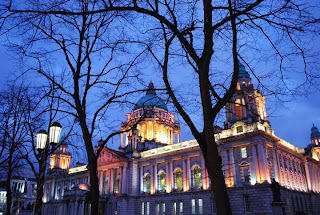 If you're just tuning in, Nija had a really awesome time in Belfast and took some beautiful pictures of what appears to me to be a very twinkly place. After enjoying that post thoroughly and realising how much I miss her (as if I needed reminding), I posted something stupid, with an ugly picture of myself to boot, because I took this whole blog-as-stream-of-consciousness thing way too far. I carelessly didn't consider the fact that now Nija's gorgeous story had been demoted in favour of something that was unfunny and unenlightening. I removed my story, but think her post deserves better.